These actions seem to be having an impact. With the provinces' leaders politically committed to forest conservation, annual forest loss declined in 2016 and 2017. 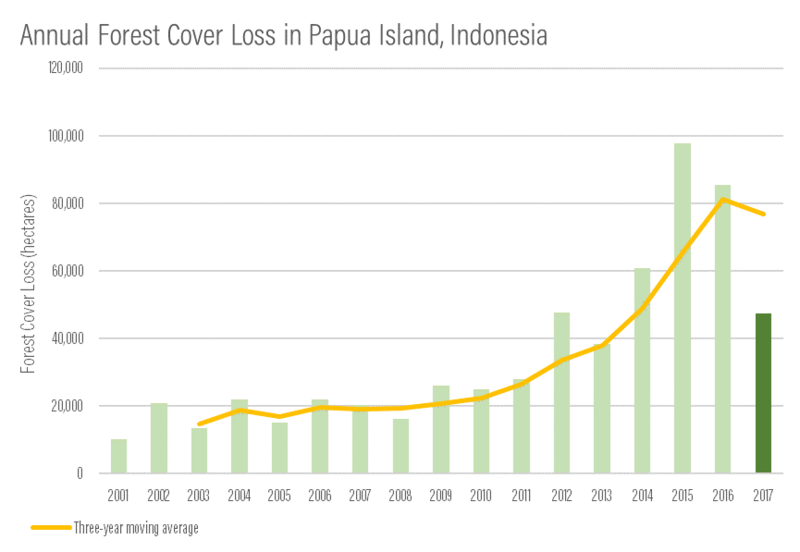 However, Papuan primary forests remain at risk. Not all government forces are as pro-conservation: the national government's infrastructure development agenda in the provinces may involve forest clearing. Here are three things to know about protecting Papua's forests, which will be essential if Indonesia wants to meet its emissions targets and Papua to develop sustainably. 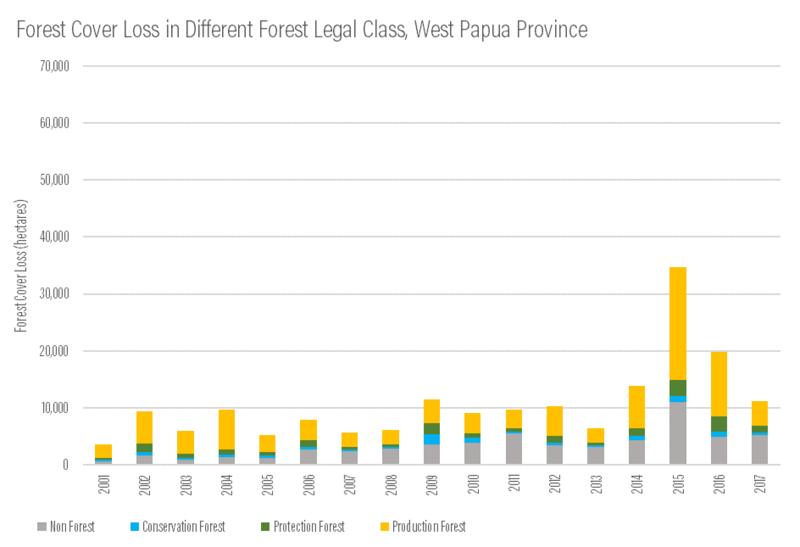 Forest loss took its biggest leap in West Papua in 2015, compared to other years. Only 3 percent of it occurred via illegal encroachment. 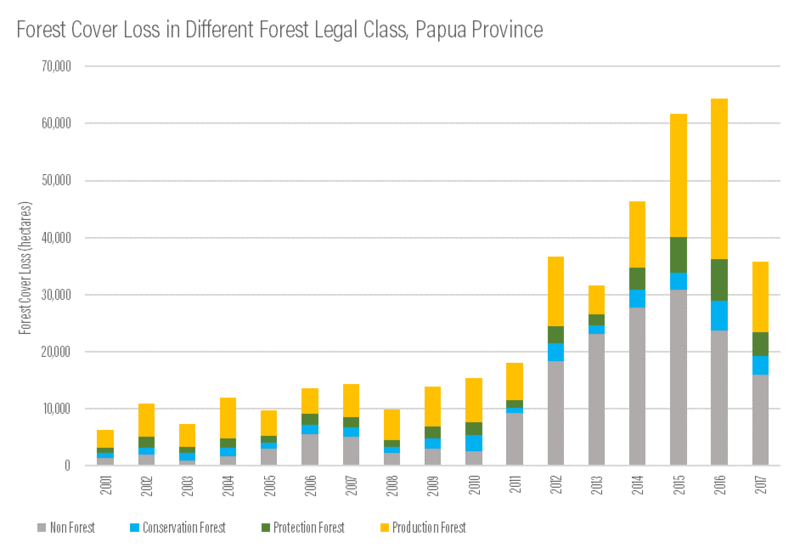 Most of the deforestation in both Papua provinces occurred within Production Forest and Other Land Use areas, which can be considered planned deforestation. But even this permanently damages the forests' rich ecosystems (PDF). For example, in West Papua Province, 2015 and 2016 emissions from degraded peatlands contributed about 50-55 percent more than emissions from forest clearing. Meanwhile, in Papua Province, emissions from peatlands have never exceeded emissions from tree cover losses for 17 years. If the Indonesian government can maintain at least 70 percent of Indonesian Papua (29 million hectares, almost 72 million acres) as a conservation areaand restore degraded lands in the protected areas, the government can avoid 2.8–3.3 gigatons of carbon dioxide emissions. That means saving the Papuan forests would take Indonesia past its Paris target, which is to avoid 1.8-2.0 gigatons of carbon dioxide by 2030. The provincial governments must focus the economic development that considers forest protection in it. How? Developing alternative sectors beyond the current practice of natural resource extraction could boost economic growth. For instance, ecotourism has huge potential for beautiful Indonesian Papua. Using integrated agroforestry to expand the production of non-timber forest goods, like rubber, cocoa, honey, orchids and fruits, could also be another source of livelihood. During the transition to these alternatives, rather than closing all opportunities for plantations, these concessions could be allocated to old plantations and to degraded and unproductive land, which surpassed 2 million hectares in 2013 in Indonesian Papua. However, relying on plantations must be done with caution. Economic benefits should funnel back to the people, instead of just enriching the elite and widening inequality. Customary forest schemes can also help. A study found that customary forest is the best scenario to be implemented in Papua. Indigenous people in Papua have for hundreds of years relied on forests as for food, medicine and cultural needs. They can play a key role today in protecting the forest against the encroachment.